These high stress levels may be at least partly attributed to the fact that many of us simply have more to do at this time of the year. Because we have more tasks to keep track of (even if those tasks are going to parties, buying gifts, and other fun stuff), the prefrontal cortex in our brain is overtaxed. This can affect our memory and overall ability to cope. Add in the extra pressure of maintaining a perfect diet and workout schedule, and you have a recipe for sleep problems, digestive difficulties, and tense muscles – all of which can add to our stress. And when we’re stressed, we tend to overeat. You can probably see why holiday stress can create a vicious cycle of guilt. Reframing our expectations that we need have a “perfect” holiday while staying disciplined can end the frustration. So don’t beat yourself up if everything doesn’t go as planned. In the long run, our happiest memories are sometimes the ones when things didn’t go as we’d pictured them, or the times we slowed down to take in the moment. Letting go of expectations of perfection–from ourselves and others–will ultimately help our health. Play games. If you get together with family or friends in the next weeks, why not introduce a low-tech way to have some old-fashioned fun by playing board games? Board games can also offer cognitive benefits, laughter and fun, and bring together all different ages. Stay mindful. A mindfulness practice has obvious benefits when we’re extremely busy. Even if you’re not a regular meditator, just five minutes a day of meditation can help you cope with holiday stress. And why not share the love? Suggest a short meditation before holiday meals. It can set the tone for a peaceful celebration. Studies show that group meditation can have powerful results. Get moving. Fitting in some exercise can be easier when you mix it up by with physical social activities with loved ones. Snowshoeing, making snowmen, skating for those in the cold climates: there are plenty of options. If you don’t live in a snowy clime, try bowling, a walk around the neighborhood, or a nice hike among the cacti. You may not end up with six-pack abs, but might start a new holiday tradition. Suggesting fun activities for social gatherings also helps take the focus off food. Cook up some love. Looking for a unique gift idea? Want to stay away from the mall and its atmosphere of seemingly relentless consumerism? Try baking some holiday gifts. Almond flour stevia/monk fruit cookies or brownies can be a big hit, or even start making some natural soaps as gifts. It’s easy, natural and fun! Go green. When you’re thinking about ways to keep your body healthy over the holidays, don’t forget that the planet deserves love too. It’s easy to have a green holiday season (even if it’s snowing). Use recycled wrapping paper, serve food on real plates (not paper), and consider turning the heat down a degree or two for large gatherings (maybe you’ll encourage guests to bring out their tacky holiday sweaters). To conserve electricity, use LED lights only, and defrost your freezer before you load it up with holiday baking. Learn to say no. This is a tough one for many patients who come to the office. However sometimes refusing a social invitation or a request to do work is the healthiest choice for everyone involved, especially if that gathering is with people you’ve had contention with in the past. Also, saying no the the cookies and cakes of holiday events can also be done. Dr. Morstein can give you a tincture of gymnema sylvestre to carry in your purse or pocket; put a couple of dropperfuls of the tincture in your mouth, swish for a minute and swallow and—believe it or not—you cannot taste anything sweet for up to one and a half hours. If you put something sweet in your mouth, you’ll need to spit it out, it will feel gross and awful. It really works! Saying no is a good thing to do at time to preserve your mental/emotional and physician health. Keep your gut healthy. 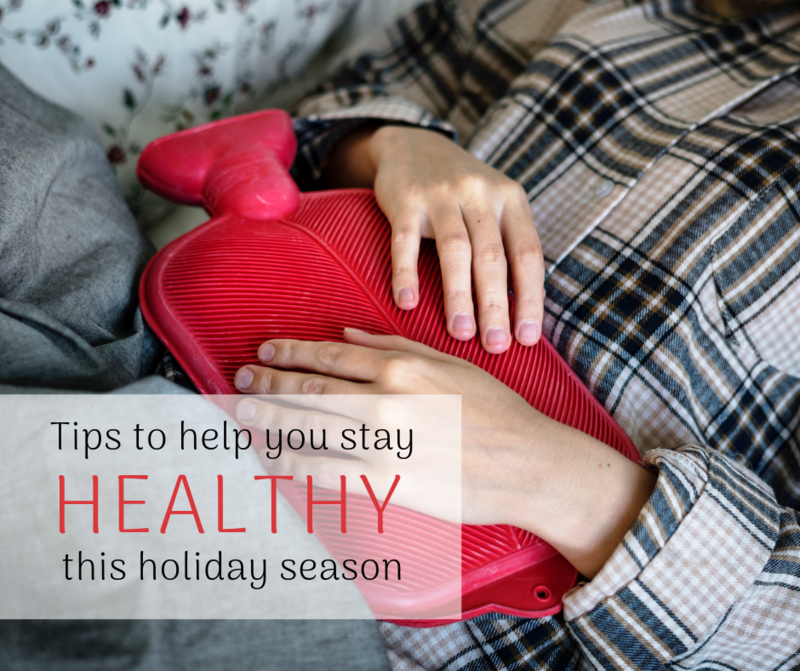 Sugar laden holiday treats, cocktails and parties galore can really put a damper on your gut health, so can over-eating, especially over-eating many meals. Avoiding sweets as in #7, and taking some high quality probiotics and digestive enzymes prior to meals to give your gut a healthy boost and some likely much needed assistance! Also, it’s best to stop eating at the first sense of fullness. Start some healthy food traditions. The internet is bursting with healthy holiday recipes. Think about your loved ones’ food preferences and find some yummy dishes to bring to gatherings. Other guests might thank you for providing an alternative to Aunt Mary’s special salad! Try replacing carb heavy side dishes with healthy ones like Rutabaga and carrot mash or creamy butternut squash and thyme! Remember it’s OK to say no! Use organic fruits and vegetables and grass fed/finished meat and poultry. Be grateful. The holidays don’t always go as planned. Sometimes we have to go to work instead of eating great meals. Sometimes we miss people who are no longer in our lives. It’s normal to experience sadness at this time of the year. Acknowledge your feelings and be gentle with yourself. Take some time to think of the good things (even if they’re not always picture-perfect). Grateful people experience better sleep, more optimism, and improved relationships. And we could all use a bit of that at this time of the year. Happy Holidays and New Year from all of us! We look forward to working with you to create a fulfilling and healthy start to 2019.